Most of us should know by now that language changes. It’s why the 14th Century prose of Geoffrey Chaucer is nearly impenetrable to modern day speakers of English. 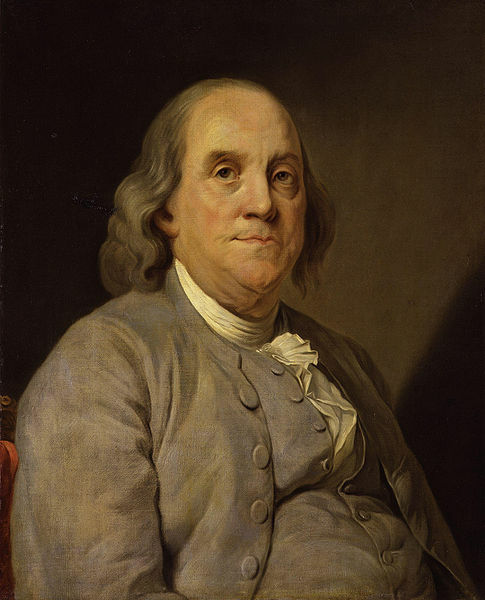 It is also why Benjamin Franklin’s phonetically transcribed pronunciation of the English word natural sounded like natyural (phonetically [nætjuɹəl]) rather than our modern variant with a ch sound (phonetically [nætʃəɹəl]). However, it is often taken for granted on this blog that language change can be understood as an evolutionary process. Many people might not see the utility of such thinking outside the realm of biology. That is, evolutionary theory is strictly the preserve of describing biological change, and is less useful as a generalisable concept. A relatively recent group of papers, however, have taken the conceptual machinery of evolutionary theory (see Hull, 2001) and applied it to language. Broadly speaking, these utterance selection models highlight that language change occurs across two steps, each corresponding to an evolutionary process: (1) the production of an utterance, and (2) the propagation of linguistic variants within a speech community. The first of these, the production of an utterance, takes place across an extremely short timescale: we will replicate particular sounds, words, and constructions millions of times across our production lifetime. It is as this step where variation is generated: phonetic variation, for instance, is not only generated through different speakers having different phonetic values for a single phoneme — the same speaker will produce different phonetic values for a single phoneme based on the context. Through variation comes the possibility of selection within a speech community. This leads us to our second timescale, which sees the selection and propagation of these variants — a process that may “take many generations of the replication of the word, which may–or may not–extend beyond the lifetime of an individual speaker.” (Croft, in press). Recent mathematical work in this area has highlighted four selection mechanisms: replicator selection, neutral evolution, neutral interactor selection, and weighted interactor selection. I’ll now provide a brief overview of each of these mechanisms in relation to language change. Replicator Selection and Neutral Evolution. A significant property of neutral evolution models is that the probability of fixation–fully successful propagation of a variant–is a function of the frequency of the variant. Hence, neutral evolution appears to be a manifestation of the frequency effects in language change identified by the usage-based model. Assuming all else is equal, this implies the linguistic variant with the highest frequency is more likely to be propagated. Importantly, replicator selection and neutral evolution are independent of the interactors (speakers) producing the variant. The unusual thing about language, however, is how the interactor’s environment is often another interactor. To capture this dynamic, Blythe and Croft coined the term interactor selection, which they then apply to two particular processes: neutral interactor selection and weighted interactor selection. Because the interaction results in the replication of some linguistic variants (replicators) over others in language use by virtue of the frequency of interactions between speakers, it can bring about differential replication. Here, the only factor influencing replication is the relative frequencies with which interaction takes places between interactors. Of course, it is not simply the case that we approach all speakers as being equal. Be it consciously, or unconsciously, we do assign judgement values on the people we’re communicating with. As such, the likelihood that a linguistic variant is propagated depends on how highly valued the speaker is to a particular hearer. And it is through this process we get weighted interactor selection. Therefore, the linguistic variants of one speaker may be differentially replicated over speakers with less heavily weighted productions. 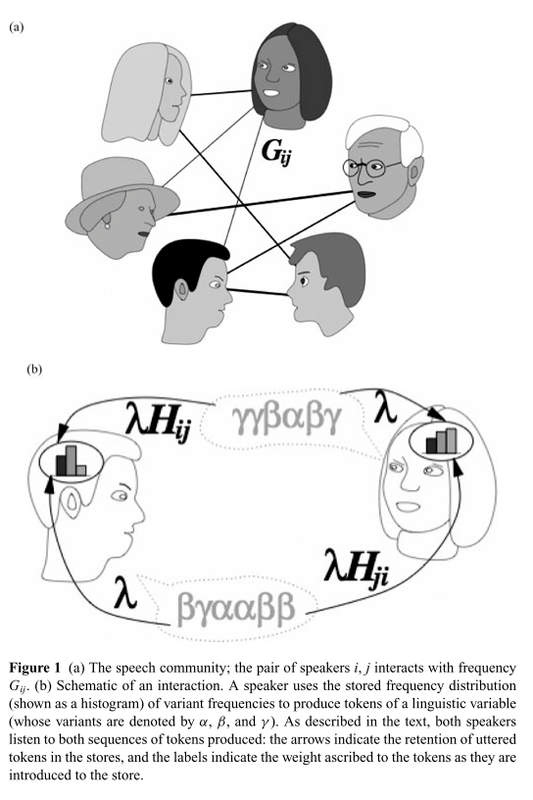 What both forms of interactor selection highlight is the relationship between the speaker/hearer and the linguistic variant: that is, the likelihood with which a variant is propagated depends not only on the frequency of interactions, but also on the differential social valuation of the speakers. We’re still in the early stages, so assessing the plausibility of these models by comparing them with quantitative data is still limited to only a few case studies. Still, there are a few instances we can draw upon, one of which being Baxter et al.‘s (2009) recent evaluation of Trudgill’s (2004) claim: that new-dialect formation in isolated speech communities, such as the emergence of New Zealand English in the late nineteenth century, are products of drift and neutral interactor selection. What Baxter and his colleagues found, on the basis of a statistical mechanical model, was that these two mechanisms are, by themselves, insufficient to explain the rapid pace of convergence in the population. The next step, then, is to utilise this incremental approach, by gradually testing each form of selection, and seeing what selection dynamics correspond to real world examples of language change. I’ve submitted this post to the NESCent competition to get a travel award for the ScienceOnline2011 contest. Nice. I’m getting myself Croft’s Radical Construction Grammar for Christmas! Good buy. I’m still wading through some of Croft’s work on RCG. As you’ve probably guessed, I’m quite a big fan of the usage-based/construction grammar approaches. Bybee has also published another Cambridge title this year “Language, Usage and Cognition”. University of New Mexico = Croft + Bybee in the same linguistics department! Oh, awesome. I just had a quick glance at it in Google Books. Looks good. Great article James. I really enjoyed Croft’s (2000) book ‘Explaining Language Change: An Evolutionary Approach’ back in the day – the stuff he outlined in there seemed to make a lot of sense and gave definition and cohesiveness to the idea of general evolutionary principles acting on language and language change. Very interesting to see how the theory has developed in the newer work. Thanks Anne. Yeah, I’m really impressed by the stuff by Croft. Plus, they drafted in a physicist, Richard Blythe, who happens to be working at Edinburgh Uni. I’m assuming he’s responsible for the cool math.